Galicia is a region located in the northwest of Spain, with the officialstatus of a nationality of Spain. There are four provinces in Galicia: A Coruña, Lugo, Ourense and Pontevedra. Near of 3 million people lives in Galicia, mainly in the coastal area, around the cities of A Coruña and Vigo, the two most populous cities. The capital is Santiago de Compostela, in the province of A Coruña. Santiago is the end of the Way of Saint James, a historical route of pilgrimage and communication of Culture from Medieval Age to the present. Two languages are official and widely used in Galicia, Spanish and Galician, a Romance language similar than Portuguese. The cities of A Coruña and Ferrol are located in the northwest of Galicia. A Coruña (Corunna in English) is the second-largest city in the autonomous community of Galicia. A Coruña is the capital of the province of the same name. It is located on a promontory in the entrance of an estuary on the Atlantic Ocean and it host a very important port and an oil refinery. Although much of the heavy industry is based on the shipyards and metalworks of the neighbouring city of Ferrol, both cities are involved in a transition process to terciary sector from the 80s. The most known monument of A Coruña is the Tower of Hércules. It is the most ancient Roman lighthouse still in use today, and it has been included on the list of UNESCO World Heritage Sites. Now we're on the platform as well!!! Nice to see you here on the project website. Many people of Europe mix up the geographic term Galicia what is a region of Spain with the landscape between Poland and Ukraine what named Galizia or Galicia too. The German history has probably more connections to the latter name nevertheless it now no more exists as a country or political term. Our seniors´ group aready had heared during the project “seniorstoryboard” of Corunna/La Coruna/A Coruna as a city in the Spanish province Galicia. In May 2007 we had a meeting there, visited Ferrol, the famous Way of Saint James and in the Galician capital Santiago de Compostella. It was an event to meet our already known Spanish partners in their home country. We were surprised about the hugh number of Spanish students we had not seen before – and the kind reception there. In 2010 my intention was to show my family that Spanish region where go holidaymakers of Germany rerely: Galicia with A Coruna. A private come together with one of the friends of the Spanish seniors´ group was a highlight for me and my family. Your information about the division of Galicia let me check once more our travel route relating to these four parts: We used a car and drived a for us higher-than-average long tour (6000 kms) from our German country Saxony via France, the French and Spanish Basque provinces along the Northern coast of the (for German pupils well known too) Bay of Biscay. to Ferrol and A Coruna. Our longer stay was in Sanxenxo, a very nice near the Atlantic Ocean situated place. On the way back we had again an accomodation near the Galician villages A Rua and O Barco. – Near Toulouse we had a longer stay again in France. The way home led across France, via Switzerland. After exactly one month we arrived at home. That spring time with a trip across many beautiful areas in South of Europe was a very impressive one. I found out, that we crossed all the four Galician provinces but not the main places Lugo and Ourence. 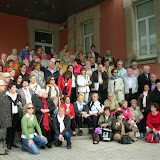 I think that the meeting in A Coruña was during the project "Routes towards Europe" in May 2008.